I have this daydream in which I'm sat in the SPOnG Orbital Platform on my own one day and someone's left a guitar lying around. And, because making sure all the release dates are in order for hidden object puzzle games gets tedious sometimes, I just... pick it up. And pick a string. An hour later everyone gets back from lunch to find me stood, hunched over in a trance-like state, dripping with sweat, squalling out something that sounds like the result of Jimi Hendrix joining Explosions in the Sky. Everyone stands, transfixed, as I change the way they think about the guitar. It's an experience so epic and all-consuming that someone decides to fire the thrusters and drop us into the atmosphere so we can all burn across the sky while I play, and then the citizens of Earth cut my face into the moon as a testament to how amazing I am at guitar. So... Hello Rocksmith. This is not a review, by the way. For reasons that'll become quickly apparent, I'm not well-equipped to provide a thorough review. This is a report on what happens when you give a witless n00b with fingers of pudding like me a copy of Rocksmith 2014 to see if he can learn guitar. Things started well enough. The set-up requires you have a guitar and a lead that enables you to plug into your console (360, in my case) through a USB port. You set some basics, such as which hand you favour, whether you want to play bass, rhythm or lead guitar (I went 'lead', because of... vanity, probably) and your level of experience. So far, so straightforward. Then you get to the main menu, which is the point at which your hand stops being held. Listed are 'Learn a Song', Session Mode', 'Nonstop Play', 'Lessons', 'Guitarcade', 'Multiplayer' and 'Uplay'. It's not entirely clear what all those are without a bit of exploration, but it was pretty obvious where I needed to head. The lessons start off reeeeaaaallll simple. Like, 'here's how to hold your plectrum' simple. Which is good, because that's the exact sort of thing I imagine a self-taught guitarist can find they've been doing wrong for half a decade. Once you get to the stuff that involves playing actual notes the lessons start by giving you an explanation of what you're about to do, with video thrown in for good measure. When it's time to give it a go yourself, you'll be presented with an on-screen fretboard scrolling towards you that's not dissimilar from those you'd find in the likes of Rock Band or Guitar Hero if they were still around. Except, you know, this one has real notes on it. When it works, it's a great system. I can't, in fact, think of a format better suited to presenting you with how to play a song. It shows you where on the fretboard your digits need to be, gives you the timing in *ahem* real-time and has other parts of the music playing to give you audio clues as to what you should be doing. One huge advantage of a system like this if you're a bit useless is there's no-one in the room impatiently watching you. That was also, alas, where me and Rocksmith 2014 bumped heads. You see, my fingers flit across the fretboard with all the dexterity of haunted sausages. Rocksmith has a couple of tricks up its sleeve to help you if you get stuck. First it will slow the music down for you. Sometimes this helps. Then, it will take you back out of the exercise to show you video footage of some hands (there's never a head) doing what you're attempting to do, with some more explanation. But, sooner or later, you're left to repeat the exercise again and again until you get it. There's no suggestion of an alternate version of the riff. The game certainly can't nail the exact reason you're going wrong so that you can fix it. I was attempting to get a bend right, for example, and failing spectacularly. The game (which talks in a rad American accent) kept saying I was on the wrong string. I wasn't. For reasons that still escape me I was muting the string and producing a duff note. Understandably, however, the game couldn't see that. I'm not picking fault with the development team here – there are just natural limits to what a piece of software can do for you (for the time being, at least). I firmly believe that Rocksmith has a better chance of teaching me guitar than a book or a website, but I have a sneaking suspicion that I'm just too cack-handed for it to be up to the task of teaching me. If, however, you are less rhythmically-challenged than I am, I suspect the game/software can do a lot for you. A friend who'd probably fall into the 'intermediate' range took a pop at it and after five minutes or so came away quite pleased, having mastered the rudiments of Everlong by The Foo Fighters. There are 50 tracks on the disc, running the gamut from Def Leppard to the Deftones. There are well over 100 tracks available for download, too. Also added this time out are the 'Guitarcade' games, which are mini-games playable with the guitar. They're pretty good fun even if, like me, you have bear paws for hand. So, for the even vaguely able, there's a lot here. If, like me, you have barely-functional flesh-clubs where your hand should be, you may not get very far. Are you sure that the guitar you used was properly tuned? If you were playing the correct string but producing the wrong sound, it may have required tuning. I don't think the game can tell *why* the sound you're making is wrong, only that it is. 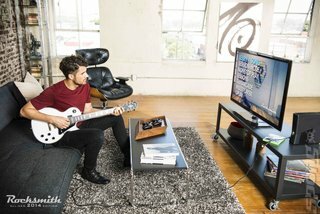 Does the game allow you to tune your guitar before loading it up? If it doesn't I think that is 1 fault they should of thought of especially for beginners. Is it true that there is terrible lag on consoles, if your audio goes through the HDMI lead? It has a tuner built in and will ask you to tune the guitar when you first start, then anytime that the tuning changes for a specific song. Most songs are standard tuning so you do not have to re-tune very often.